William "Count" Basie (August 21, 1904 – April 26, 1984) was a prominent American jazz pianist and band leader. Like his contemporary Duke Ellington, Basie assembled a group of premiere musicians and through innovative use of rhythm and improvisation, and his spare yet suggestive piano work, Basie largely defined the distinctive Kansas City jazz style that would, in turn, influence the emergence of modern jazz. For his contribution to classic jazz and his anticipation of modern developments, Basie is regarded as one of jazz music’s all time greats. Basie is known for his inimitable statements on the piano, but it has also been said that his real instrument was his band. Basie brought to perfection the union of opposites characteristic of much great art: His crisp, contrapuntal piano and the relaxed, even swing of the rest of his rhythm section; his incisive, minimalist piano and the powerful sound of his orchestra; and countless pairs of hard/soft soloists dialogging with each other. Combining soulful blues and upbeat, celebratory rhythms and solo performances, Basie's music possessed an emotional resonance that elevated Big Band jazz beyond the conventions of popular swing jazz. Basie was born in Red Bank, New Jersey, to Harvey Lee Basie, and Lillian Ann Childs and lived on Mechanic Street. Later, he would be referred to as the “Kid from Red Bank” (the title of a tune). Bill had a brother, LeRoy Basie. His father worked as coachman for a wealthy family. After automobiles replaced horses, his father became a grounds keeper and handyman for several families in the area. His mother took in laundry, and was Basie's first piano teacher when he was a child. He was taught organ informally by Fats Waller. Along with Waller, James P. Johnson, Willie “The Lion” Smith, Lucky Roberts, and other pianists of the Harlem stride tradition would be Basie’s prime influences. Basie toured the Theater Owners Bookers Association (T.O.B.A.) vaudeville circuit, starting in 1924, as a soloist and accompanist to blues singers. Sometimes, he would also provide musical accompaniment to silent movies. His touring took him to Kansas City, Missouri, where he met many jazz musicians in the area. Kansas City was then an important transit point and a musical scene connected to nightlife, similar to New Orleans’ Storyville, had begun to thrive there, giving birth to a distinctive Kansas City style. In 1928, Basie joined Walter Page's Blue Devils, and the following year became the pianist with the Bennie Moten band based in Kansas City. Moten’s ensemble was a good "territory band," a term signifying the rising popularity of jazz outside of urban scenes and of popular bands that would range far from home for engagements. Moten himself was a capable, but unremarkable, ragtime pianist who had the good sense to put to use the young pianist he had recruited: Basie. Except for Basie, the really outstanding musician of the band was trumpeter Oran “Hot Lips” Page. The band had had its successes (notably a 1928 version of "South") but it was still a few steps away from the swing era. Occasionally, one could hear an accordion in the ensembles, which gave it a pleasant but unsophisticated rural sound. Within a mere two years, the band had absorbed many of the best elements of Walter Page’s Blue Devils, a competing band that had dissolved. These included Page himself, a formidable bassist who gave the band a powerful new swing. Basie’s piano had become gradually more present ("Moten Swing," "Prince of Wails") and he soon came to all but own the band. He started his own band in 1934, but shortly after returned to Moten's band. When Moten died in 1935, the band soon dissembled, and in 1936, Basie, along with several of Moten’s key alumni, resurrected it under a new name, Barons of Rhythm, soon to become the Count Basie Orchestra. In addition to touring, the band performed nightly radio broadcasts, and serendipitously, the young Columbia Records producer and talent scout John Hammond—a music legend who had discovered the seventeen-year-old Billie Holiday in 1933, tracked down the forgotten Bessie Smith for a final recording session in 1937, and later launched the careers of Bob Dylan, Aretha Franklin, and Bruce Springsteen—picked up the Basie band on his car radio. Inspired by what he heard, Hammond set out for Kansas City to hear Basie in person, and in October 1936, the producer arranged a recording session in Chicago that he later described as "the only perfect, completely perfect recording session I've ever had anything to do with." Basie's band honed their repertoire at a long engagement at a Chicago club. It was at this time that he was first called "Count" Basie by a local disk jockey, a term of distinction for outstanding jazz greats that included Joe "King" Oliver, Edward "Duke" Ellington, and Bessie Smith, who was crowned the Empress of the Blues. Soon the Basie band was expanded to the full big band size (13 musicians), and by the end of 1936 Hammond brought the band to New York, where it opened at the Roseland Ballroom. By the next year Basie took up residence at the Famous Door, and the Count Basie Orchestra continued to perform in New York until 1950. Basie’s music was characterized by his trademark "jumping" beat and the contrapuntal accents of his own piano. Basie also showcased some of the best blues singers of the era: Billie Holiday, Helen Humes, and later Big Joe Turner and Joe Williams. Most congenial to the band was Jimmy Rushing, called “Mr. Five by Five” (due to his short stature and large girth). Rushing epitomized the spirit of Basie’s orchestral blues, a blues that was more urbane and often humorous than traditional blues. Even more importantly, Count Basie was a highly successful band-leader who was able to hold onto some of the greatest jazz musicians of the 1930s and early 1940s, like Buck Clayton and Lester Young, and the band's brilliant rhythm section, Walter Page, Freddie Green, and Jo Jones. He was also able to hire great arrangers that knew how to use the band's abilities, like Eddie Durham and Jimmy Mundy. With his newly formed band, Basie quickly brought the Kansas City style of jazz to perfection. While not fundamentally different from the style played by other swing era bands in New York or Chicago, this way of playing was characterized by a supple, light beat and the astute use of riffs—short melodic patterns played repeatedly, especially towards the end of a piece, to heighten the atmosphere. The alternating playing of several riffs could go on indefinitely, until a climax was reached. Unfortunately, the recordings of that era were limited to about three minutes, so they cannot fully convey the equivalent of the band’s live performances. Another Basie innovation was the introduction of two tenor saxophones “dueling” with each other. The first, historical pair consisted of Lester Young, with his detached, cool sound and Herschel Evans with his more traditional, intensely hot style. This was the starting point of a long history of saxophone duels within the Basie Band and beyond. On trumpet also, the elegant Buck Clayton and the powerful Harry “Sweets Edison” were a perfect complement to each other. On trombone too, there were usually two major voices at any given time, including Bennie Morton, Dickie Wells, and Vic Dickenson. Most of the time, Basie played very few notes, but these were perfectly chosen to fill the silence he used with equal mastery. His unique, crisp style can immediately be recognized by knowledgable jazz fans(only Nat Pierce has been somewhat successful at imitating him). At times, his piano was reminiscent of Earl Hines’s jumpy and ethereal rhythmic playing ("Moten Swing," with Bennie Moten). Much of the time, the stable and powerful qualities of his stride piano heritage were obvious. His playing was often pure Fats Waller, with the stomping left hand the pearly flurries of the right hand (John’s Idea, 1937), except that it was also pure Basie. Over the years, Basie’s subtle sense of rhythm, combined with his powerful stride playing, would produce a unique synthesis that gradually evolved into his signature minimalist style. He would play next to nothing but fill the room with his few notes. Many tunes also highlight Basie’s double role as soloist and accompanist of his key players (e.g., in Roseland Shuffle, 1937, in his dialogue with Lester Young). Occasionally, Basie would also produce piano solos ("How Long Blues," 1938) or contribute extended solos to his band’s performances ("Boogie Woogie"). Basie’s rhythm section has often been described as the best in jazz history. It was certainly the most cohesive of its time and has reached proverbial fame. Starting with Basie’s presence in the Moten band, it came into being over the years when, first, Walter Page’s bass gave real swing to the band. Later, Jo Jones on drums introduced the even 4 beats that contrasted with earlier drummers emphasizing 2 beats out of 4. Jones was also a formidable soloist. When finally Freddie Green added his guitar to the band, the section was complete. Over the next 50 years, Green would practically play nothing but a succession of chords that completed the even dynamism of the section. Interestingly, each time a new element of that section was added, the already existing members toned down their playing without changing it to reach the perfect balance that made the ensemble famous. Much of that subtle quality was lost once Jones and Page departed, but even the more muscular nature of drumming in the New Testament band maintained the essence of that quality thanks to the lasting presence of Freddie Green and Basie himself. By the late 1940s the Big Band era appeared to be at an end, but (after downsizing to a septette and octette in 1950) Basie reformed his band as an even larger 16-piece orchestra in 1952, and led it until his death. Basie remained faithful to the Kansas City style and helped keep jazz alive with his distinctive piano playing. The new band gave its real meaning to the name big band. Its huge sound was brassier than that of the first band. It also relied on sophisticated arrangements, while the first band had mostly relied on star soloists and their ability to play "head arrangements." These were simple arrangements learned by heart by musicians who, for all their talent, were poor sight readers. In that sense, the new band was more professional and less dependent on particular key players. Any capable musician could fit in and replace a departing member of the band. What was gained in weight and in sophistication was perhaps compensated by a slight loss in originality over time. The new soloists of the band, while excellent, were not quite of the historical caliber of a Lester Young. The emotion-laden sound of the ensembles and Basie’s own input became all the more important. With his New Testament band, Basie moved into the special realm of classic jazz being played in the era of bop and modern jazz—concurrently with developments that were of a totally different nature. While he and his musicians remained swing musicians in essence, they did evolve with the times, creating the big band music of after the swing era. The major soloists who passed through the new band through the years include Clark Terry on flugelhorn, Joe Newman on trumpet, Paul Gonsalves, Frank Foster, Frank Wess, and Eddie “Lockjaw Davis" on tenor, Sonny Paine and Louis Bellson (a white musician) on drums, and many more. All of them could be considered transitional artists, mixing elements of classic jazz with the complexities and tone of modern jazz. By the mid 1950s, the Count Basie Band had become one of the preeminent backing big bands for the finest jazz vocalists of the time. Joe Williams was spectacularly featured on the 1957 album One o'Clock Jump, and 1956's Count Basie Swings, Joe Williams Sings. 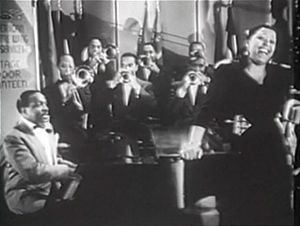 Ella Fitzgerald, the quintessential swing singer, recorded several times with the Count Basie Orchestra. These records are highly regarded by critics. Fitzgerald's 1963 album Ella and Basie! is remembered as one of Fitzgerald's greatest recordings. With the "New Testament" Basie band in full swing, and arrangements written by a youthful Quincy Jones, this album proved a swinging respite from the "Songbook" recordings and constant touring that Fitzgerald was engaged in during this period. She toured with the Basie Orchestra in the mid-1970s, and Fitzgerald and a much tamer Basie band also met on the 1979 albums Digital III at Montreux, A Classy Pair, and A Perfect Match. Frank Sinatra had an equally fruitful relationship with Basie; 1963's Sinatra-Basie and 1964's It Might As Well Be Swing (both arranged by Quincy Jones) are two of the highest points at the peak of Sinatra's artistry. Jones provided the punchy arrangements for the Basie band on Sinatra's biggest selling album, the live Sinatra at the Sands. In the 60s, Basie was often compelled to compromise on the choice of his material to maintain his band. In 1960, he appeared as himself (along with his band) in the Jerry Lewis film Cinderfella. But by the 70s, his fame had reached a peak, including with the public at large, not unlike the popularity achieved by Louis Armstrong. He was named the greatest jazz musician on earth by the British publication Melody Maker and was invited to perform for Queen Elizabeth before even Duke Ellington earned that distinction. 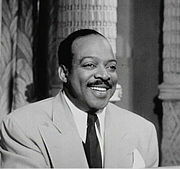 Count Basie died of pancreatic cancer in Hollywood, Florida, on April 26, 1984 at the age of seventy-nine. 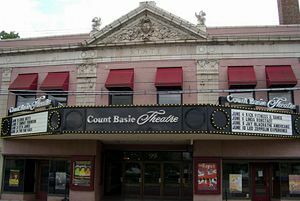 The Count Basie Theatre in Red Bank, New Jersey was named in his honor. “Basie's status as a great musician was not a matter of extension and elaboration of blues idiom basics as was the case of Louis Armstrong and Duke Ellington," says jazz critic Albert Murray. "Basie's claim to fame and prestige was based on his refinement of the fundamentals that make jazz music swing. The Basie hallmark was always simplicity, but it is a simplicity that is the result of a distillation that produced music that was as refined, subtle and elegant as it was earthy and robust. There is no better example of the un-gaudy in the work of any other American artist in any medium." Basie's consummate artistry, like Ellington's, is a credit to his visionary understanding of the jazz idiom and his leadership as much as to his innovative keyboard work. Basie's band is often cited as the most important precursor of the emergence of modern jazz, and it is not coincidental that the leading innovator of forties, the saxophonist Charlie Parker, was a native of Kansas City. Basie gathered many of the premiere jazz artists of the era. Saxophonist Herschel Evans and his distinctive "Texas moan;" the blues-based "Hot Lips" Page, who had earlier performed with Ma Rainey and Bessie Smith; jazz balladeers Jimmy Rushing and Joe Turner; and above all brilliant, boundary-breaking tenor sax improviser Lester Young (known affectionately as "Pres") established a style for the Basie band that drew from the excitement of traditional jazz and informed it with innovations in rhythm and phrasings that would lead jazz in radical new directions. "Count Basie's music is not about protest," said Murray. "It is about celebration, and . . . what [Basie's music] generates is a sense of well-being that even becomes exhilaration." Basie, Count. Count Basie Collection (Artist Transcriptions). Hal Leonard Corporation, 2004. Basie, Count. The Piano Style of Count Basie: Some of Basie's Best of Advanced Piano. Alfred Publishing Company, 2001. Dance, Stanley. The World of Count Basie. New York: Charles Scribner’s Sons, 1980. Murray, Albert et al.Good Morning Blues: The Autobiography of Count Basie. Cambridge, MA: Da Capo Press, 2002. A Centennial Celebration of the Life and Music of Count Basie Very complete website with extensive biographical information by Dan Morgenstern, photo essays, and musical samples and video, as well as a very complete bibliography. Rutgers University’s Institute of Jazz Studies. IMDB Appearance in movies and soundtracks form recordings. NY Times Obituary, April 27, 1984. Download sample of "Jumpin' at the Woodside" by Count Basie & His Orchestra. This page was last modified on 10 December 2017, at 00:40.